Barbara Morgan, the former Idaho school teacher who served as Christa McAuliffe's backup for the Teacher in Space program, sits down for this NASA interview. As NASA's first Educator Astronaut, Morgan will be a mission specialist and robot arm operator during shuttle Endeavour's STS-118 flight to the space station, targeted for launch in June. The fourth servicing mission to the Hubble Space Telescope extended the craft's scientific potential with an advanced camera and performed a major overhaul on the orbiting observatory's power system with the installation of new solar arrays and an electrical heart. The crew of space shuttle Columbia's STS-109 mission tell the story of the March 2002 mission in this post-flight highlights film. "Space Shuttle: A Remarkable Flying Machine" is a NASA movie that takes you inside the first voyage of the space shuttle program. Commander John Young and pilot Bob Crippen flew Columbia in April 1981, opening a new era in American space exploration. A commercial Sea Launch Zenit 3SL rocket disintegrated in a fiery catastrophe aboard its oceangoing platform Tuesday, destroying a sophisticated telecommunications satellite payload in a dramatic launch pad explosion reminiscent of the space program's early days. The Ukrainian/Russian booster was igniting its main engine when the 20-story vehicle inexplicably fell, triggering a hellish fireball that engulfed the floating Odyssey platform. The live video transmission from the equatorial launch site in the Pacific Ocean was abruptly cut seconds after the first signs of trouble. Condition of the Odyssey, a converted Norwegian oil-drilling platform, was not known as of late Tuesday. A brief Sea Launch statement said that "all personnel are safe and accounted for." The platform was cleared of all workers before the rocket was fueled, with the launch team stationed aboard a command ship three miles away. There was no immediate indication from Sea Launch of what could have caused such a devastating malfunction. "The Sea Launch Zenit 3SL vehicle, carrying the NSS 8 satellite, experienced an anomaly today during launch operations. Sea Launch will establish a Failure Review Oversight Board to determine the root cause of this anomaly," the official statement said. Delayed a few days by unfavorable sea conditions in the launch area and again Monday by what the company described as a "minor technical issue," Tuesday's countdown proceeded toward an on-target liftoff at 2322 GMT (6:22 p.m. EST). In the final five seconds, the launch team announcer was heard calling out "main engine start command" and then "go inertial" as typically expected. But as the smoke and steam billowed from the Russian RD-171 engine firing to life, the rocket didn't begin its normal quick rise skyward. Instead the three-stage rocket fell out of the camera view as the entire platform was enveloped in the explosion. Whether the rocket tipped over, fell downward from the platform or collapsed was inconclusive from the video seen live. Sea Launch immediately switched its broadcast to a company graphic and then signed off. A Zenit 3SL is held in place on the launch table by holddown clamps at the base of the first stage. The clamps are not supposed to release until computers verify that the engine is running with good thrust. The powerplant has four chambers, four bell-shaped nozzles and a single turbopump. It is designed to generate 1.6 million pounds of thrust. Tuesday's flight would have been the 24th for Sea Launch since debuting in 1999. It was the second total failure for the Zenit 3SL vehicle configuration. The first occurred on March 12, 2000 during Sea Launch's third mission when a mis-configured valve caused a pressure loss in the second stage. The vehicle was unable to reach orbit and fell back to Earth, destroying an ICO mobile communications satellite. There also was an incident in June 2004 when the Block DM-SL upper stage shut down early, leaving the Telstar 18 satellite in a lower than planned orbit. But the satellite was able to overcome the shortfall. Sea Launch had planned to conduct six commercial satellite deployment missions in 2007, with Tuesday's flight being the first. The schedule included the Thuraya 3 mobile communications satellite, direct-to-home broadcasting spacecraft for DirecTV and EchoStar, plus the Spaceway 3 broadband satellite and Galaxy 19 for Intelsat. The Sea Launch consortium formed in 1995 with partners Boeing, Russia's RSC Energia, the Ukrainian rocket-builders Yuzhnoye and Yuzhmash and Norwegian ship-builder Kvaerner. The rocket's first and second stages are Ukrainian-made, with the Russian Block DM-SL upper stage used to propel payloads into geosynchronous transfer orbits. All three stages are fueled with kerosene propellant and liquid oxygen. Ruined in the explosion was the NSS 8 spacecraft belonging to operator SES NEW SKIES of The Hague, Netherlands. The 13,050-pound satellite featured 56 C-band and 36 Ku-band transponders for commercial and governmental communications, high-speed Internet services and video broadcasting. NSS 8 was slated to fly in geostationary orbit 22,300 miles above the Indian Ocean at the 57-degree East longitude slot. The satellite's coverage zone would have included two-thirds of the world's population from the vantage point, with reach to Europe, Africa, the Middle East, the Indian subcontinent and Asia. The high-power craft, built by Boeing using its 702-model design, was expected to replace the aging NSS 703 satellite currently serving the area. In response to the launch failure, SES NEW SKIES said NSS 703 would remain in place through at least 2009 and future plans would be shuffled. "SES NEW SKIES has already initiated the construction of NSS 9 for launch in 2009 into the Pacific Ocean Region. NSS 9 is intended to free up NSS 5 which in turn will then be free to relocate to 57 degrees to replace NSS 703." The loss of NSS 8 is not expected to have an immediate impact on existing SES NEW SKIES customers or revenues, the statement concluded. But the advanced satellite, originally ordered in early 2001, would have enabled nearly double the amount of transmission traffic than the current NSS 703 craft given its vast number of transponders and power, officials had said before launch. 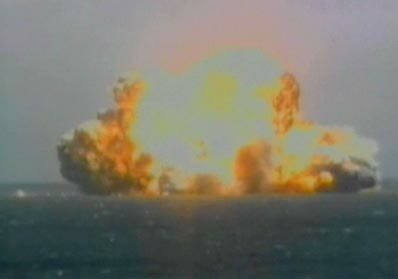 A short movie of the explosion as it was seen live on the Sea Launch broadcast has been posted by someone on the popular YouTube website.